So, it's official. H and E are "kindergartners." Last week they had their first full week of school, Monday through Friday half-days in the afternoon. It appears to have been an easy transition for them. They are generally happy to go, and generally happy when they get home. 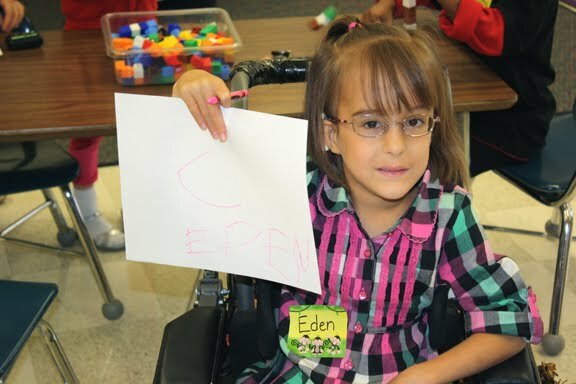 Eden has the same one-on-one aide that she had in preschool, and that has certainly helped make everything simpler in terms of not having to train a new person on all of her equipment and cochlear implant, plus a familiar face and pair of hands in the classroom. The only glitch has been with busing, and I haven't fully decided how big of a glitch it is. Originally, when I got the bus schedule, it said that the girls would be dropped off at home 25 minutes after school got out. That seemed like a long time, since we literally live 5 minutes from the school, so I called transportation to find out why. I turns out that there are 2 other students riding home after school and they will be dropping them off first, and H and E off last. Plus, there is an issue of the big buses coming in at the same time and there maybe being a wait to get the girls' bus out of there. So, after a reasonable explanation as to why the bus would be home so late, I was satisfied. 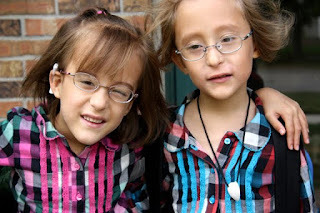 Then, on the first day, the girls got home 12 minutes before I was expecting them, and I was told that it was easier than they thought and they would probably be able to get them home at that time every day (12 minutes after school release). This seemed great at first...until the next day when Eden started crying after being dropped off and told me that she didn't have time to "climb on the stegosaurus" because she had to get on the bus. The same thing happened the next day, with both girls crying because they didn't have time to play. I figured out that missing 12 minutes of kindergarten a day translates into missing 1 hour of kindergarten a week, which translates into missing approximately 12 days of school a year right off the bat, in addition to whatever time them will have to miss for illnesses and/or appointments. It just doesn't seem right to me, and I am puzzled as to why anyone thinks it is a good idea. I guarantee that no one would find it acceptable for me to bring them to school 12 minutes late every day. My kids should be in school the same amount of time as all of the kindergartners. They should be doing the same activities as the other kids. I don't want them to be singled out. I really only want for them to have access to the same opportunities as all the other kids, and to be treated with the same kindness and consideration. Because they are kids. Just like the other kids. I've been following your blog for a long time (though I don't comment much), and this issue has me heated! I think you're right, and this busing glitch IS a big deal. I completely agree that it doesn't make sense at all for the girls to miss a portion of the school day just to improve the transportation time. I hope you are able to look into this issue further and find a better solution! 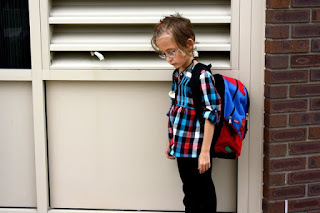 In my class (all kids with special needs) last year we had to put our kids on the bus about 10 minutes before dismissal. It took longer for the bus to be loaded and the bus then had to get to the elementary school on time. It wasn't ideal (it wasn't just my kids, but the kids included in other classes that missed out on the last part of the day), but that was what we were required to do. I think that is completely ridiculous. The school day is the school day, and they should be there for every minute of it! Having them miss recess is cruel. Even more important in my mind is the way that it separates them from other kids. Other kids notice difference in schedule much more than exactly who is doing what. Having them leave at a different time reinforces their differentness from the other kids, when when it comes to curriculum, they are no different than anyone else. They need stegosaurus time, and the other kids need to see them getting stegosaurus time! Since it sounds like you are home, have you thought of going to get them a couple of days a week? I work full time, but in kindergarten I was able to get off early twice a week to go get my twins. It turned out to be fun for them and a good networking time for me to get to know the other picker-upper moms, many of whom who hang out after school when the weather is good. Congratulations to all of you! My eldest son is in a special needs school in Gr 3, they allow the disabled kiddies to leave 10 minutes too, also to get them on the busses on time. But obviously if you doesn't work for your girls it doesn't work. Regards Mandie from SA. My dd has Autism. She leaves class about 1 minute before anyone else to get on the bus. it so she can to throught the hallway without the other kids. It's too distracting to her otherwise. However, the big difference is a. she's not missing anything and b. the school asked me. My school tried to get me to do stuff earlier too (like get on the bus). I hated it. I always felt like I was missing out on something, because I was. My mom always had to go to the school (year after year) and tell them to make other arrangements because she wasn't going to let me miss class. they board them 50 minutes before the other kids to ensure they aren't caught up in the K-6 grade kids all going to their buses madness at the end of the day.. Nathan misses the last *lesson* of the day and a small recess.. he gets home an hour earlier than everyone else though and that seems to make him happy, lol. Um. Okay, folks. Time out. Taking kids out of class before dismissal IS ILLEGAL. End of story. I can't look up the reference for that now but it is, assuming you're all in the US. It has to stop. You're right, losing an hour a week of education is totally unacceptable. Not to mention socially damaging and potentially humiliating, especially when they're older. You need to call your school principal tomorrow and let him or her know that this is an unacceptable situation. Your kids, like all kids, need to be present for every minute of the school day, including recess. And the school has to make sure that it happens. I am with you as well, they should be treated just the same as all the other kids. That includes being in class as long as their peers. We are having similar issues with Elizabeth at recess at school. It is hard to choose your battles and to not be that 'parent' but you often need to be. I agree with the comment from Becca. If you read your girls IEPs, there are minutes listed. If they are getting on the bus early, they are missing IEP time. This entitles you to compensatory education. They are violating the IEP..I would call the principal! I find often times they aren't aware something is happening! I hope this gets worked out for your girls! They need their play time! I am a special education teacher and teach a preschool class for students with disabilities. Getting the kids on and off the bus is tough because there is only so much room for the buses and so much time and so many kids..it is a mad rush. Obviously, some kids need special care and help getting on the bus but it is also important that they not miss the school day. Perhaps the school thought that the solution to your disappointment in the long bus ride was to have them leave earlier? Perhaps you can suggest that they leave 2/3 minutes earlier, not 10? Also, maybe they can go back to the system they were using initially. If a 25 minute bus ride doesn't upset the girls, maybe it will be a nice time for them to calm down and decompress after the school day. Just throwing some thoughts out there, sometimes good intentions can go astray. This is a battle that I have been fighting for years. What I have found to work is that I nicely remind the special education director that a school day consists of X minutes - and that Noah is entitled to the same minutes as every other child. Not only is he entitled - it is required by law. Last year he was actually getting home before school even dismissed. I was not happy - so I made some phone calls. It turns out the driver was doing it because it was "easier". Sometimes life just isn't easy now isn't it. You have many battles ahead of you and you are right you do not want to be "that mom". But you also do not want to be the mom that the school knows they can walk over. Man! We had transportation issues as well. I should reiterate what Becca says, it's illegal to let the special needs kids out early--for the same reasons that Lori discussed--because they have IEP's that designate their school day down to the minute. For us, the law was actually hampering us because Charlie was sitting out in the heat roasting because he couldn't be taken off campus a second earlier. I don't usually comment, I think I've commented maybe twice, but this is insane!! That's not fair to your kids to miss school!! Recess and play are important to every child's development, there's no reason why they should miss it!! I don't think I've ever commented, but I agree with becca about it being illegal. 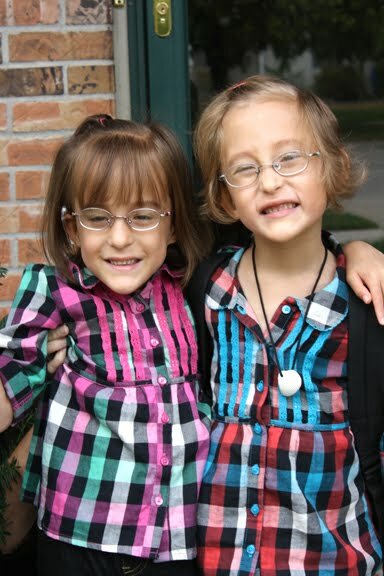 Not only because of time laid out in their IEP, but in the state of Michigan, instead of having so many school DAYS. The students are required so many HOURS per school year. If they are missing almost an hour of school a week, they are not meeting that requirement for ANY student. I would definitely go to the school. Teething troubles, my daugther very small, hearing impaired ex premmie & has just started reception (aged 4) & they have put her in with the preschoolers (age 3) at lunch time, lovely that she will be well looked after but she is separate from all her classmates & I havent put her in mainstream school for her to be made to feel different after 3 three of school. I think Becca is right. In California schools get money only for the days the children are actually present, so this would be 10-12 days less of money that they would receive per year. They probably did it with the best intentions. After you asked why it took 25 minutes to bring your girls home they probably changed their routine to get them to you sooner. I would just talk with the principal and ask to have them in class as long as everyone else. You may have to settle for them coming home 25 minutes after the bell, though, unless you can make an argument on why they should be the first to get dropped off the bus route.